Of the six components of the index, three are in bearish territory (equity flows, bond flows and long-only positioning), and one — equity market breadth — is very bearish. By contrast, credit market technicals are very bullish, and hedge fund positioning is bullish. The Sell signal is triggered when investor sentiment goes above 8.0, and the Buy signal, when investor sentiment passes under 2.0. The duration of the signal is between one and three months. Other indicators developed by Bank of America Merrill Lynch’s research department have already triggered Buy signals. The fund managers’ cash indicator, which looks at the percentage of portfolios that fund managers keep in cash, is at 5.1% — above the 4.5% that triggers a Buy signal (the Sell signal is triggered once cash goes below 3.5%). The BofAML Global Breadth Rule, which says investors should buy when a net 88% of markets in the MSCI All Country World Index trade below their 200-day and 50-day moving averages, has also seen this condition fulfilled, as the percentage is now 89%. Of 45 equity indexes, 42 are now oversold, which is the most since January 2016. Going back to the Bull and Bear indicator, currently it is still neutral at 3.1; but with so much bearishness out there, it is worth keeping a close eye on it to see if it is pushed below the Sell trigger level. 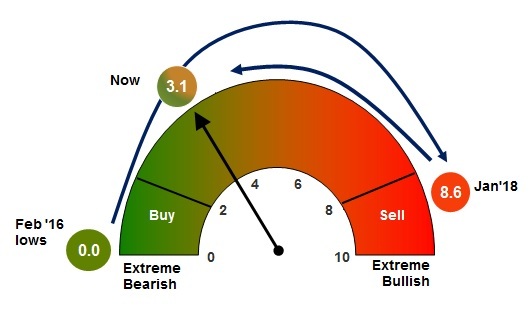 The Bull and Bear indicator is still at a neutral level. Source: BofAML. Of global stocks, 63% are in bear market (80% in emerging markets, 61% in the US), according to analysis by BofAML. In 2011 and 2016, this percentage peaked at around 70%, whereas at the 2009 lows, 97% of global stocks were in bear market territory (95% in emerging markets and 98% in the US). Looking at fundamentals, growth in earnings per share at a global level peaked at 23% in March, and is now 16%; if we take the US out of the equation it is down to 10%, the bank’s analysts wrote in recent analysis. For the Bull and Bear indicator to breach the excessively bearish level of 2.0 and trigger the Buy signal, at least three things are needed: an unwinding of Commodity Futures Trading Commission (CFTC) crude oil longs, outflows of more than $30 billion from emerging markets, and high yield bond funds seeing more than $15 billion in redemptions. So far, it doesn’t look like they are imminent. Investors may want to keep some powder dry, then, instead of using it all on Halloween. Pingback: Will Green November follow Red October?